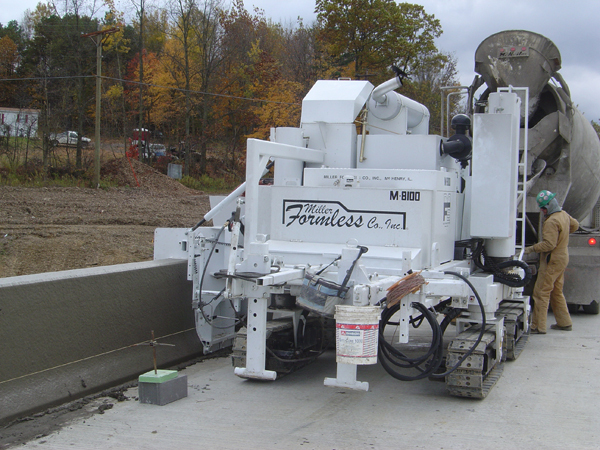 We have used Miller Formless exclusively for our curb and gutter, barrier wall, and side mount paving pan needs for over 20 years at Walsh Construction. Everybody over there at MFS are great people and are more than happy to help you with your needs. We own quite a few 8800’s and an 8100 and like them for the ease of moving and setting them up, plus they leave a great product. The right tool for the right job. You can’t expect to reach unattainable goals with inadequate tools. How often we have all learned that lesson. In this trade, the right tools make all the difference in the world which is why we choose to use Miller Formless curb machines. If you want quality work you use quality tools. 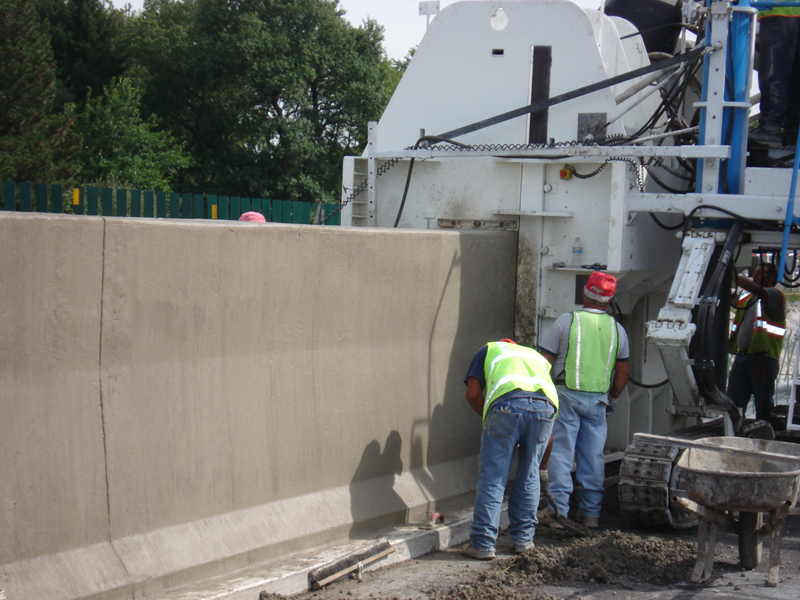 We have been using exclusively Miller machines ever since we started slip form curbing. We do so for a reason: they’re the best. 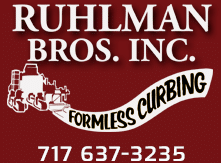 Over the years, we have purchased ten Miller Formless curb machines, and we have never lost a full day’s work because of equipment failure. The right tool for the right job, that’s why we use the best. Oglesby Construction bought our first Miller Formless machine in the early 1970’s. To date we have 19 in our fleet of Millers with our 20th on order. 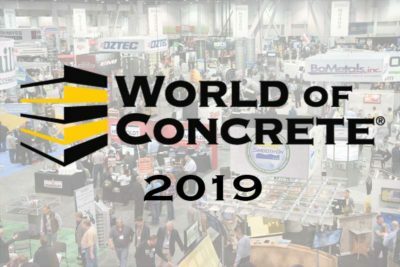 Being strictly a premier concrete company in Ohio with no excavation or prep in our scope of work, our machines are run hard throughout the season. We normally mob, set-up and pour day in and day out and then move on to the next contractor. 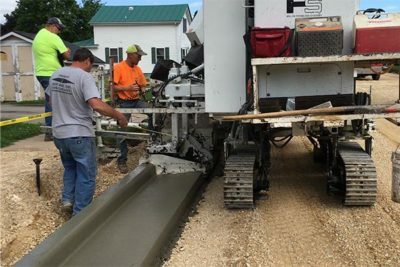 As every contractor preps their jobs in a different manner, the Miller machines can adjust to different off sets and grade variances form the track elevation to the placement of the curb. Then it could be taken to the next job and pour barrier wall, with our current maximum height to date being 92″. And the versatility of the M-1000 in a parking lot is comparable to none. There is no given reason why Oglesby would stray away from Miller Formless machines. 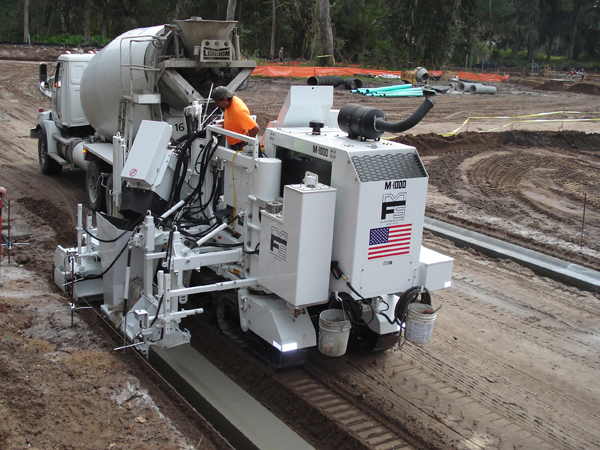 We have a great communication lines open with the staff at Miller Formless in McHenry, Illinois and will continue to be a huge backer of the Miller Formless Slipform machines. 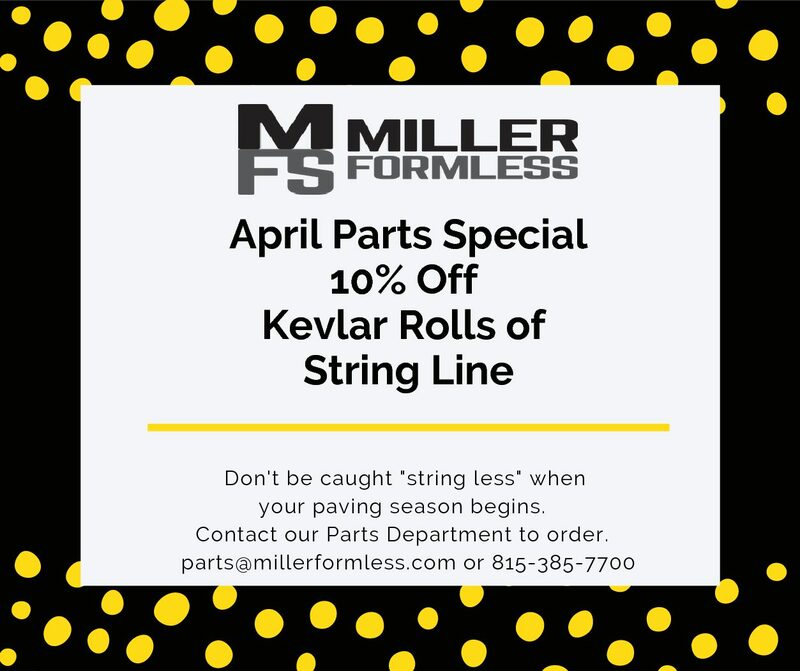 Our Monthly Parts Special for April features 10% off rolls of Kevlar String Line. To order, contact our Parts Department at parts@millerformless.com or 815.385.7700.